I'm David Bird. A Quest-trained Cognitive Hypnotherapist and NLP Master Practitioner in Leighton Buzzard, Bedfordshire, UK. I trained with the founder of Cognitive Hypnotherapy, Trevor Silvester, at The Quest Institute, Regent's University London. Before qualifying as therapist, I was both a listening volunteer and trainer for the Samaritans, providing anonymous support for people from all walks of life in emotional distress and despair. There's nothing more rewarding than when those I work with tell me how their lives have changed in ways they never imagined possible. In my early-twenties, I'd spend the week at work wishing for the weekend. Only to wake up on Saturday mornings and stare blankly at the wall. Sometimes for hours. One particular day, I felt a shift. The empty, hopelessness switched to frustration. Some degree of motivation. That's when I started trying to understand. To change things. First I went to self-help books. Everything helped a little. But nothing changed a lot. I understood more about myself, but still felt stuck. I was always searching for the 'thing' that would fix everything. Make me better. Good enough. Fix me. I had no idea then how that very behaviour - that need - was part of the problem. Then it all crept up on me. Binges of self-medication and self-sabotage. Book-ended by all-or-nothing teetotal U-turns of impossible diets and exercise regimes. Doomed to crash and burn with a blow-out once I failed to find true happiness. I finally found rock-bottom. Eventually I curbed the self-medication. Though motivated more by fear of deepening wounds I'd caused than anything else. But I still hadn't realised my addictive tendencies were only a symptom. That I was actually suffering with anxiety. Scared to do things others wouldn't think twice about. It wasn't until I changed job roles outside my comfort-zone when I began to consider the 'dips' I'd experienced for years could be depression. I had CBT, private therapy, and even trained as a Clinical Hypnotherapist. But I still struggled. My life had changed. But in many ways I was still feeling the same. Almost by accident, I picked up a book on Cognitive Hypnotherapy. Light-bulbs went off. Things made more sense. I signed up with Quest and started seeing a Cognitive Hypnotherapist. Within two sessions I noticed real differences in my life. I realised I wasn't stuck being the person I thought I was. I could change. The world actually started to look like a different place. Full of possibilities. Ones I hadn't even seen before. During my training I took every opportunity to use what I learned on myself. Not only did this accelerate my personal development, it gave me invaluable experience to build on when helping others. I now run a busy and successful Cognitive Hypnotherapy practice in Leighton Buzzard. Both face-to-face and via Skype. And there isn't a session that goes by where I'm not rewarded seeing the changes I get to help others make. As a Cognitive Hypnotherapist, I'm trained in a broad range of skills and techniques. 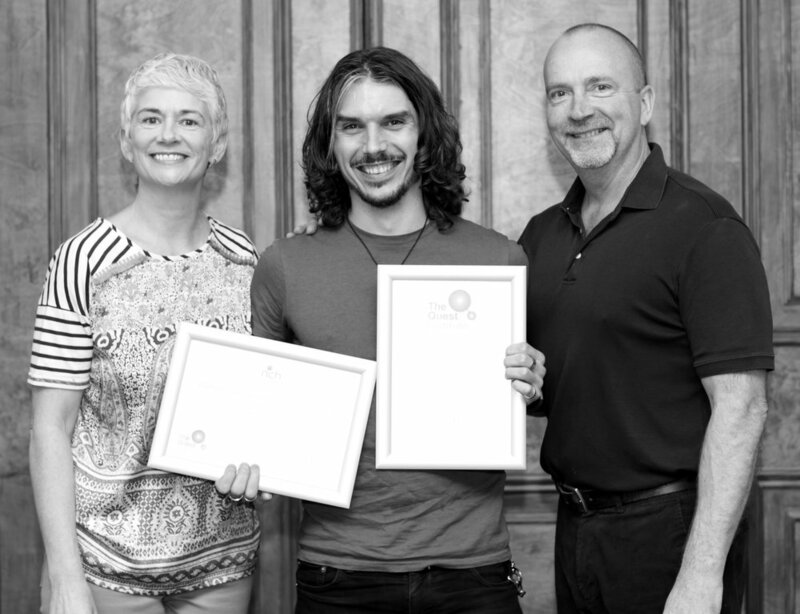 Awarded by The Quest Institute, the founding organisation of Cognitive Hypnotherapy. Verified by the National Council for Hypnotherapy, the HPD is accredited by the NCFE. This is the only independently accredited professional qualification for Hypnotherapy available in the UK. This is an internationally recognised qualification. NLP is about "modelling human excellence", using observation and language to do so. NLP's use in therapy stems from the work by co-creators Richard Bandler and John Grinder. By analysing and reverse-engineering the approaches of three outstanding change-workers: the family therapist, Virginia Satir, the hypnotherapist, Milton Erickson, and the gestalt therapist, Fritz Perls.